[miningmx.com] – GOLD Fields’s newly appointed South Deep manager delivered a brutal assessment of the R8.5bn west rand project’s current condition which led the firm last week to abandon its ramp up and break-even forecasts. Speaking in a conference call to analysts, Nico Muller, vice-president of Gold Fields’ South African operations (South Deep), praised the asset’s safety and sustainability record, but he was withering of its engineering and management track-record calling the latter ‘dysfunctional’. “Unfortunately as far as the management is concerned there was a big issue,” said Muller on February 12. “I’m not sure how to say this softly. I think the team was largely dysfunctional for many reasons,” he said. Muller, who was previously chief operating officer at Royal Bafokeng Platinum, was appointed to South Deep on October 1, 2014. “I think the team operated under a lot of pressure, given the variance between the actual output and the corporate expectations and what had been communicated to the market,” he said. “So there was a lot of noise and a lot of pressure. This made it very difficult to develop core strategies to focus on the enablers that will drive up production,” he said. Nick Holland, CEO of Gold Fields, told Miningmx in an interview following the group’s December quarter figures last week, that South Deep would not meet its planned 2015 production build-up while break-even would be a year later in 2016. South Deep was due to produce between 650,000 to 700,000 oz by 2017, but Holland said the project’s final production target was now a matter for conjecture. “We will focus on reaching 229,000 oz in 2015 which will be a 15% increase over the 2014 production figure. Then we will re-assess where we are. We have not yet seen the productivity improvements. Those targets are all under review,” he said. 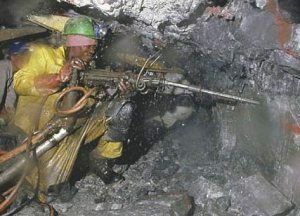 Muller also commented on “unfortunate” circumstances after Holland hired Australian miners with expertise in mechanised mining to join the South Deep team at a time when South Africans were being retrenched from the operation. “So the perception was from the DMR [Department of Mineral Resources] and the unions that we are bringing in foreigners at the same time as we were reducing South African employment opportunity. There was massive political resistance to the whole initiative,” said Muller. “I think it created a lot of tension between the Australian team and local management, who had to interact with the DMR and the unions. I think that gave cause to a less than ideal outcome which wasn’t anticipated in the beginning,” he said. However, Muller said he was optimistic regarding building production at South Deep adding that alot of the problems could be repaired. Standard Bank Group Securities analyst, Adrian Hammond, commented in a recent research note that the transparency regarding the problems at South Deep was a good omen. “Although this has been bad news for the share, we think that it is good for the long-term fundamentals for South Deep,” he said. “We believe that the forthcoming and transparent management style from new leadership is likely to be positive for the mine and the group,” he added. One of the major benefits of South Deep is that Gold Fields could maintain a “steady state profile” for at least a decade with predictable, low all in costs. Said Holland last week: “2014 was the low point really for South Deep. We have to set the mine up for the long-term and that starts today; in fact, it started last year”. Production from South Deep in Gold Fields’ 2014 financial year was 200,000 oz, a one third decline over 2013 levels. Overall, Gold Fields produced 2.2 million oz of gold last year, a 10% improvement over 2013. It hauled in all in sustaining costs, lifted revenue and reduced net debt by $282m to $1.45bn, a 16% reduction.